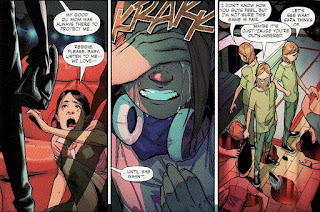 This issue things get violent very fast. In an explosive rage, Reggie kills his family, crushing his parents and siblings. Only one sister, hiding in the house, escapes by running away. While we don't see the actual act, the crushed and bloodied bodies are shown while a squad of Reggie's talk about what just happened. Gruesome. But for me, I have to say the scene fell just a little flat. We know nothing about this 'family'. Who is Reggie and what are his powers? Are these people he has kidnapped to portray his family? Or are they his actual family? Is this a studio? Or are they just being taped? Because I have no relationship with these people ... because I don't know who they are in any way ... I had no real reaction to these deaths. Yes, I get that Reggie is unhinged. But I might have felt more if I knew that was his actual Dad. Or if I saw where all this came from. I like how Lex says that this is a school night. 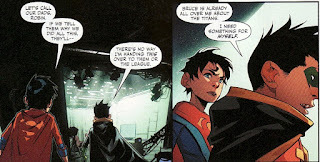 It has to be a nod to Superman saying that to the Carrie Robin in Dark Knight Returns. In showing just how devious he can be, Damien drops Jon off the building. Since he can't fly, Jon is basically falling and this Lex breaks off to save him. Now we know that Jon is somewhat invulnerable but we don't know the extent. I hope he would survive the fall. But to me, the big thing here is that Lex actually flies off to save him. Any prior version of Lex would have let Jon fall to the ground. He doesn't care about life. And it was Robin who tossed him. This was very risky of Damien. 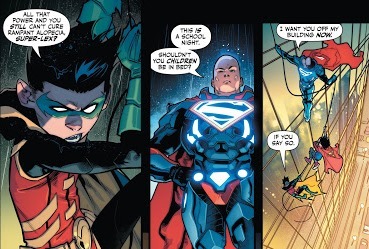 And it showed just how much this 'new' Luthor is a kind of hero these days. Once rescued, Lex ask Jon who he is. 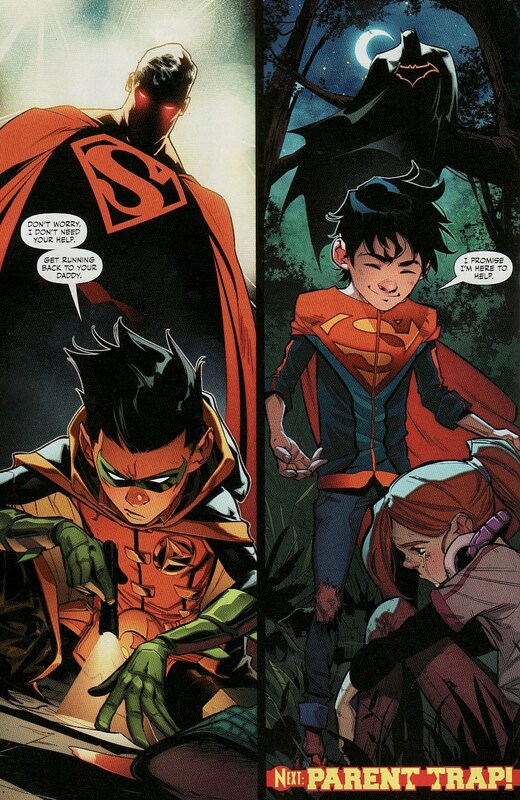 I suppose any super-powered kid might adopt the S-shield. 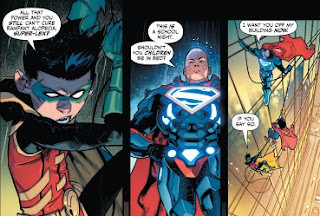 So he isn't assuming that Jon is connected somehow to the real Superman. 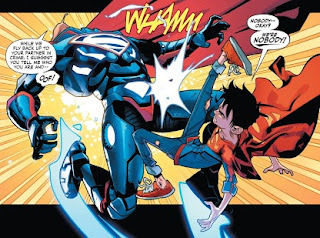 Jon says he is nobody, delivering a kick to Lex's chops! Way to protect the family!!! I just had to include this panel because of the art. Look at the lanky, pliable Jon. He looks like a kid! I absolutely love it. Kudos to Jimenez! That diversion gives Damien enough time to sneak into a lab in Lexcorp and download the information he wants to investigate the recent break-ins there. Lex arrives with Jon in tow. 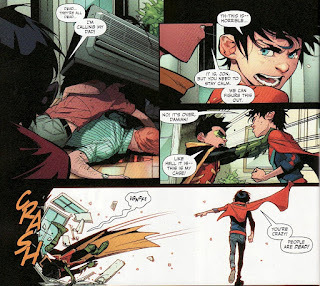 I love Jon's completely unbelievable excuse that he and Robin are runaways from St. Mary's orphanage and big fans of Lex. The whole thing was in hopes of meeting their hero. It's just crazy enough to be true ... not really. But, as usual, Damien has a contingency plan. He has planted bombs around the lab. Lex has five seconds to find and defuse them all. And in that time, the two sons escape. This scene is a wonderful look at the two heroes approach to life. Jon makes up a wild, unbelievable lie - something a normal kid might do to escape punishment. Damien plants grenades. And once again we see that it isn't Reggie who has broken in ... it's Reggies. He seems to have the power to duplicate himself. Jon used his superspeed to run through hundreds of hours of surveillance tapes to spot all the versions lurking in the lab. And then Damien uses his skills to track down who Reggie is. Reggie's family were all effected by the Amazo virus. Thank goodness for the editorial box! A throwback for sure but that shortcut information about what the virus is was appreciated. Reggie's family all had powers, became a superhero family in Providence (my old stomping ground! ), but then fell into infighting and dropped off the map. I do love how the banter between the two heroes as they compare their dads. Jon says everyone was cured from the Amazo virus. Damien says Superman isn't interested in the details. 5% remained afflicted. Will this 'my dad is cooler' be a running dialogue? But the 'detail' comment comes back as a parry by Jon when he bashes down the door to Reggie's compound. Sometimes Damien is too detail focused. As I said in the intro, there isn't any reason for Damien to seek out this relationship. My instinct is to say that he is actually lonely. Maybe he is under so much stress from expectations that he needs something fun on the side to decompress. Maybe he needs Jon as a sounding board. They are a bit in similar situations in life. And that little crack in the armor, that little look into a kid under the weight of the world, makes him a bit more relateable and humane. So seeing him say that he needs something for himself, a goal that hasn't been dictated by others, hammers home the point. This friendship is a release, a hobby, a way to breathe a little. It is the differences between the two that is the dynamic here. So when their detective work leads to Reggie's studio home and the dead bodies, the two have very different responses. Jon is clearly startled and dismayed. I doubt he has run across dead bodies very often in his life. He has tears in his eyes. He knows they are in over their heads ... or at the very least he is in over his head. It is time to end this little jaunt and call in their dads, experienced heroes. Damien, who probable has been surrounded by dead people in his life experience, isn't taken aback. He wants to continue. Remember, in his mind this is HIS case. He doesn't want this to end. I love that Jon has finally reached his breaking point, literally tossing Damien aside. This adventure is over. Much like their fathers, these two won't be easy friends. But maybe that is the purpose of this title, to show organically how respect and friendship will form. And then we get a nice cliffhanger. Damien, still looking for information in Reggie's house, doesn't know he is being watched by Superman. And Jon runs into the surviving sister in the woods without realizing that Batman is there. I love Jon's body language in that last panel. And having him say dad's line about being there to help is just spot on perfect. 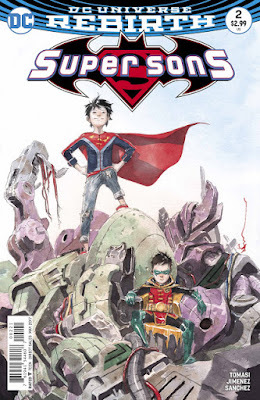 So overall, a very nice issue, pushing the plot forward and bringing some friction between the sons. It was only the Reggie scene which seemed forced a little too fast to resonate that was a little speed bump for me. "The story also introduces someone who could be a great arch-enemy for the sons. Are we seeing the opening chapter of a lifelong battle?" Well, Reggie IS a redhead. Although I guess it's true since we don't know who those persons are and we barely know them, their deaths amount to shock value. And shock is cheap. 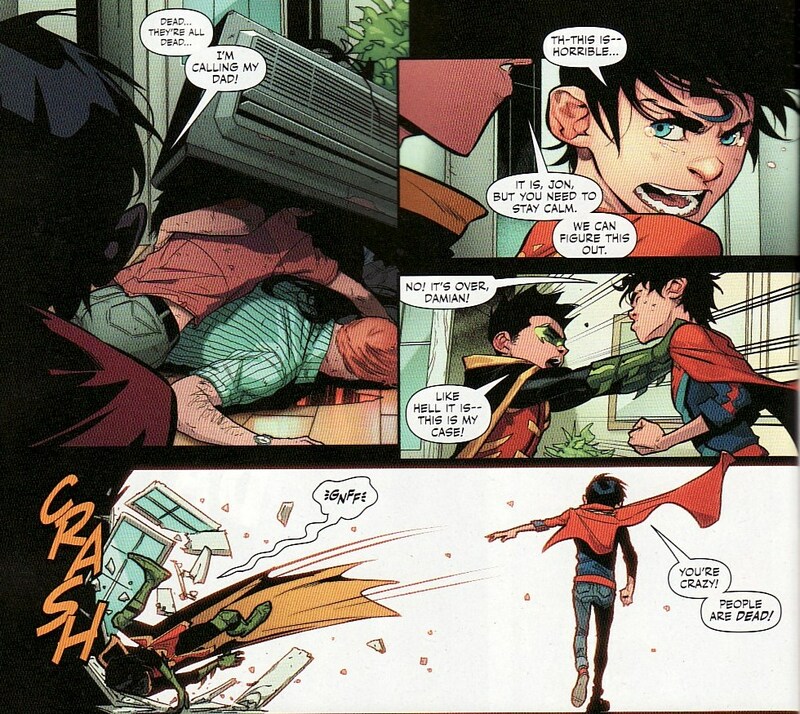 The scenes between Jon and Damian provide a very nice contrast. In a certain way they remind me of the relationship between Kara and Babs in Elseworlds' Finest: two heroes, different as night and day, fated to be friends and partners. Maybe since they are beginning their partnership at an early age, their relationship will be less troubled than their parents' one in the Post-Crisis universe. I laughed outloud with Jon's bad lies. Someone needs to teach him how to lie convincingly. He should ask his father and second cousin. Oh, God. That last page. Assuming they are their parents instead of similar-looking robots, those two panels scream "Grounded. Forever."